When compared to the competition, the visuals lack some impact. Sure the cars are in 3-D, but the environments are flat. 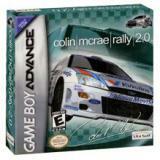 Games such as V-Rally 3 has shown how hard the GBA could be pushed. This game doesn't. Sound effects are decent, but a bit too loud. As in true CMR style, there's no music. Well, at least not in the championship. One of the unique things about this game is that the cars have some weight to them, but the lack of an analog stick as we usually have on consoles make this game a bit tougher to play. There's a lot of courses and a few game modes, but it's all not terribly exciting. I wasn't as impressed as other critics with this game. The graphics wern't great; the engine, while solid, is tough to play with a D-pad. It just seems so "par for the course" on the GBA. I was actually expecting a little more from this racer than what was given. Sure, it has more mechanical adjustments than other GBA racers, but everything else about it seems average. CMR 2.0 seemed to have come too little too late on the GBA, at least in terms of realese. As this version came out, the PS2 already had CMR 3 released. But I guess that really doesn't matter, since there's no relliance on a time period (such as the yearly sports releases) and nothing based upon real world locations. It's a racing game for the GBA, and it leaves it at that. CMR 2.0 has (had) some stiff competition to go against. V-Rally 3 had debuted a couple months before this, and had a 3-D engine with 2-D sprite-based cars. Here, the design is reversed. CMR 2.0 relies on the Mode-7 scorlling techiniqe, and gives us 3-D cars. I guess it would be greedy to ask for both in 3-D, but what can you do. CMR 2.0 is more options packed than most GBA racers out there. You can finely tune your car to your liking, there are many courses to choose from, and there are a few ways you can play. Gameplay modes include a Championship mode, single race, time trial, circuit and multiplayer. It doesn't sound so bad. And the courses range from England to France and many other rally-racing locations. But the depth of selection ends where it is more important: car selection. While you're not forced to a paticular car as in CMR 3 for the consoles, you don't have much to choose from. Five cars, that's it. A Ford Focus and Puma, a Subaru Impreza, a Mitsubishi Evolution and a Toyota Corolla. Not much. And these cars don't look very impressive in their 3-D form. It's kind of cool the developers pulled this off, but unless your car is at a distance, things get ugly. The handling physics are of nothing I've ever played in a GBA racer. Most games are fairly tight, arcadey and forgiving. But in CMR 2.0, it strives for a realistic approach. While this sounds great and is great for those looking for a challenge, I feel that it was too much to deal with in a simpler format, such as the GBA. These physics are more suitable for a controller with an analog function, not a tiny digital D-pad. It does manage to give the cars a feeling of weight, but it's more trouble than it's worth. The visuals are decent enough for this racer, but it doesn't make full use of the Mode-7 tricks like other games such as SpyHunter have used. Every course here is flat, and your only jumps are in the form of speed bumps. Rally games typically have varying elevations through their courses, but not here. Seeing how SpyHunter was able to give the look of going uphill and downhill (subtle but not drastic), I can't see why they didn't do it here. Also, what the developer tried to do for creating walls and fences just doesn't work. It's basically sprites overlapped against each other side by side. The rock walls look okay, but the wood fences don't. At first I couldn't figure out what they hell those objects were, then I realized it was a fence. If you wanted to to 3-D, why not do the same thing V-Rally 3 did? The sound is a plain, and sometimes annoying experience. Not much in music, and what's there is hardly special. There are vocal commands for the upcoming turns and obstacles, and that is pretty much the standout in the audio department. The engine noises are not extravagent, and can be annoying. It's like garbled roars or something that come out of these cars. Angry bees would have been more suitable. If you want a deeper racing experience with more realisitic handling features than most GBA racers, then this may be worth a shot. But it's hard to ignore the fact that V-Rally 3 on the GBA looks so much better than CMR 2.0. Why go for a mode-7 style racer when you can have 3-D courses? CMR 2.0 is fine in what it sets out to do, but I felt it could have been better in course design, car selection and sound.